Cairn Terriers were one of the original breeds of Scotland, originating in the Highlands and the West Coast Islands. The Cairn has been bred since time immemorial for its ability to go to earth and claw its way through piles of rocks (cairns) to get to the vermin hiding in these areas. Previously known as the Shorthaired or Prick Eared Skye Terrier, it was named the Cairn Terrier in 1910. These extremely friendly dogs can usually live for 12 years, but it is not unusual for Cairn Terriers to live up to 15 years of age if fed the right nutrition and given plenty of affection. 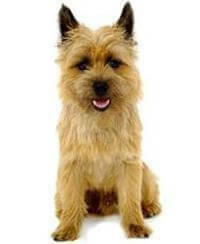 The Cairn Terrier female in good condition is typically 6kg and 28cm tall with the male being 7.5kg and 30cm tall. The Cairn has not been given the title of ‘the best little pal in the world’ for nothing. The position it holds in the hearts and minds of people who have owned one or more of them is renowned. These dogs are loyal, loving, inquisitive and intelligent, yet with a mischievous sparkle in the eye that makes them so very appealing. With a Cairn Terrier, character and personality go together. There is nothing better than to be sitting reading a book, watching television or just relaxing on the couch and having a wet nose or friendly paw pushed into your hand. Cairns are very adaptable. When introducing a new pup to other pets, never make more of a fuss of one than the other. Don't try to force the pace and expect pets to become ‘mates’ within the first five minutes. A Cairn is a double-coated dog. It is advisable that the topcoat is stripped out at the onset of summer. The breeder of your dog could help you with this or at least recommend someone to do it for you. As a responsible owner, you need to make sure all fences are of a suitable height. Remember that the weakest part of any fence is the gate, which can usually be easily opened and is often left that way. Give your dog some stimulating toys to help alleviate boredom. Exercise is most important as it keeps your Cairn trim and builds good muscle tone. By taking your Cairn Terrier for a walk, not only can you get your exercise as well, but it is a wonderful way of sharing quality time with your pet. Being a dog that has to work in close co-operation with other dogs Cairn Terriers do not look for trouble, but will defend their territory and family with great courage and devotion when required to do so. Anyone with some love to share and who is looking for a loyal and caring friend, or perhaps somebody who is a little lonely, will find their life greatly enriched by owning a Cairn Terrier. With one of these cheeky little charmers, you will have a friend for life.